Worldwide, the critics all agree, everybody needs some Soul Redemption. The debut album from Jerry Marotta and Flav Martin has been a surprise hit with fans and reviewers alike. Everyone that gets their hands on a copy is taken by surprise bat the catchy, well crafted songwriting from Flav. 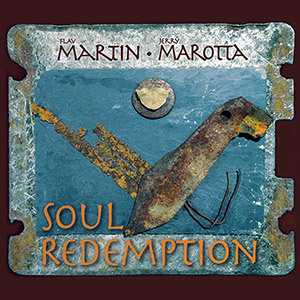 Soul Redemption is the debut release from guitarist/vocalist Flav Martin and drummer Jerry Marotta. This nine song album is filled with fresh, modern adult rock and a sprinkling of traditional world pop flavor. Whether performed in an Italian cafe or on the polo fields of Indio, these songs would feel comfortably at home in either environment. Innovative acoustic guitarist Flav Martin teamed up with long time friend Jerry Marotta to deliver a solid album that showcases Flav’s strength as a singer-songwriter and vocalist. Seven of the nine songs on Soul Redemption were penned by Flav. Standout tracks are “Soul Redemption“, “Please” and the infectious “Rio De Janiero“. The traditional Italian ballad “Coffee Song (Cosa Hai Messo Nel Caffè)” captures Flav and Jerry’s Italian roots. Fans of Peter Gabriel will delight as Jerry Marotta and Tony Levin, the rhythm section of his classic line-up, reunite for the backbone of this album. Also backing up the duo are their long time friends Peter Primamore(piano), Thor Jensen (guitar), Marc Shulman (guitar), and Gary Schreiner (harmonica/accordion). Soul Redemption was produced by Jerry Marotta and mastered by Chris Athens. Michael Cozzi (Security Project, Shriekback, Sky Cries Mary) was instrumental in mixing the album. A majority of the album was recorded at the famed Dreamland Recording Studio near Woodstock, NY. Jerry is staying busy promoting the album with radio and podcast interviews (drop us a line if you’d like to interview Jerry). Most recently Jerry was featured on LocalMotion with Rita Ryan and the crew at NewEARS Prog podcast.